I have been reading this forever! Well, a month and a half. I almost put it down several times. It's unwieldy, a large, square, thick hardcover volume that is impossible to carry around so I could only read it at home. And it's dense - not the autobiography itself, but the annotations, which are tiny and numerous and make up the majority of the text. Many contain the information I was after, explanations of various events in the Ingalls family, but some were less interesting. For instance, when Laura mentions jackrabbits in her story, there is a lengthy note all about the type of jackrabbits that lived in that area at that time. Ultimately, I started skipping over (or just skimming) the annotations that I wasn't interested in, which made the experience much more pleasant. What I wanted to read this for was the real story behind the Little House books that I've read so many times. I reread them a few years ago, and they held up, but of course being an adult gave me a different perspective and I wanted more information. The thing is, as much as they were based on Laura's life, they were still fiction. I was eager to get the real story, but kept putting it off because of the size of the book, hence the reason this was on the list for my Personal Reading Challenge this year. In terms of getting the real story, I came out of this pretty satisfied. I had read a little bit here and there about the Ingalls family, so even when I reread the series I knew that all the blathering about being so independent was not entirely true. Here, we learn much more about how Laura's story was so carefully crafted to support the family's narrative of independence and the constant move westward. For one thing, the family didn't steadily move west. They would go west, move back a bit temporarily, go west again, etc. Often they stayed with friends and relatives, or others stayed with them. It was clear that people in that part of the country at that time relied on one another quite a bit to survive. But that wasn't the story Laura wanted to tell in her fiction. At times, the narrative she developed was just more straightforward and worked better, especially for a kid's book. At other times, it was clear she wanted to tell a specific version of the story. Their time in Iowa was completely left out of the novels. It wasn't rural like the other places they lived. This part of the autobiography was comparatively gritty, with stories of spousal abuse and death. Ultimately the Ingalls family left town under cover of darkness because they hadn't paid their debts. If they had, they wouldn't have been able to afford to leave town. Many of the editor's notes regarded confusion in the timeline and inaccurate dates. Laura was writing her autobiography years later and she didn't have access to the sources we can easily view now in order to factcheck her memories. Obviously she couldn't remember every little detail and she did the best she could to put it together; it's ironic that she'd be able to actually access all of that now if she were still alive. Her gift for writing prose shone through clearly, however: "The winds which all day had blown strongly, dropped low with the sun and went whispering among the tall grasses, where the earth lay breathing softly under the summer night falling softly over the prairie and tucking them gently in." It was still rough, as this was a draft that never made it to publication, but you get the idea. Her story ends the day she and Almanzo got married. Interestingly, she was not required to say "obey" in her vows because the progressive clergyman who married them didn't believe in it. I found this quite surprisingly since I remember weddings 100 years later in which brides did promise to obey their husbands. We don't get the story of their marriage, which was disappointing because I wanted to hear more about that than what I read in The First Four Years. Despite having to slog through some of the notes, I'm very glad I finally read this book to learn more about Wilder's early life. 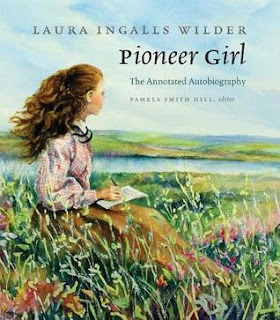 I've also just learned that a biography about her will be released this November, called Prairie Fires: The American Dreams of Laura Ingalls Wilder. I imagine this will be an easier, more straightforward read, though it's currently listed at 640 pages.